The great ICEweb vault of instrumentation, control, electrical (ICE) and other technical information includes a big subsection on "Test and Calibration Instrumentation" with many explanations and links to articles about calibration principles, terminology, fieldbus instruments, frequency and other resources. It's available here. This 15-minute video, "Control valve site calibration (auto)," delivers a real-world, onsite presentation about "auto calibration of a control valve with a smart valve positioner and identification of control elements." It's available here. 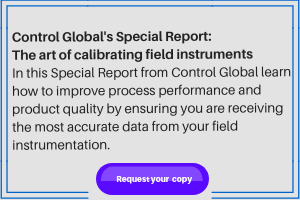 "Basic Principles of Instrument Calibration" is one of many informative entries at the Learning Instrumentation and Control Engineering website. This one defines calibration, reasons for doing it and many common terms, and includes links to the other entries. It's located here. -- Learning instrumentation and control engineering / www.instrumentationtoolbox.com. "Beamex blog" helps calibration professionals and engineers, as well as potential and existing Beamex users. It provides insightful information written by Beamex’s calibration and industry experts or by invited guest writers. Recent posts cover calibration out of tolerance, calibration uncertainty, pressure calibration basics, proof testing, temperature measurement loops, loop calibration, calibration software, documenting calibrators, and how to calibrate an RTD HART temperature transmitter. It's available here. These four 90-minute videos, "How to calibrate pressure instruments (parts 1+2)" and "How to calibrate temperature instruments (parts 1+2)" are hosted by the International Society of Automation (ISA), and include comprehensive, technical presentations by Roy Tomalino and Ned Espy, both of Beamex. They're available here, here and here. This nine-minute video, "Why Calibrate? What is calibration?—Test and Measurement Equipment (1 of 7)" is the first in a seven-module series presented by Bob Stern, senior metrologist at Agilent Technologies, who answers the most common questions he's heard about the essence of calibration. It and links to the other modules are available here. The seven-minute video, "Back to Basics: Calibration," is part of Control's online series, and covers the essential concepts of calibration, instruments used, related devices and best practices. It's presented by Control Executive Editor Jim Montague, and it's located here. This 12-minute video, "Why Calibrate? ", hosted by Northern Instruments, reintroduces a vintage animated cartoon from the U.S. Navy that offers a quirky look into the world of calibration. The company reports, "This video, though quite retro, is still relevant today and for many industries. What is the importance of calibration? All is revealed." It's here. These three videos from Beamex include "How to calibrate HART pressure transmitters," "How to calibrate RTD temperature transmitters" and "MC2 MC4 family—calibrating temperature transmitters." They're also linked to other videos and webinars. The first is available here. These two videos include "DVC 6010 Calibration on a Caldera Engineering Control Valve," which is a training video for calibrating a Caldera Engineering control valve with a DVC 6010 valve positioner, and "DVC 6010 on a Fisher 657 actuator installation and bench set," which is presented by Tyler Wasilenko. They're located here and here. This eight-minute video, "Brief tutorial on pressure transmitter calibration and test," by Stuart Brunt provides a brief overview on how to connect a pressure transmitter to a Fluke 725 DMM and HART field communicator. It's intended to impart a familiarization with basic components and configuration of a pressure transmitter calibration and nine-point test. The video also discusses how to test the transmitter and how the process works. It's here. This whitepaper, "When to calibrate in a workshop," discusses the most common reasons for workshop calibration, including commissioning; total uncertainty of the calibration; primary standards in a workshop; spare device calibration/rotating spares; safety; accreditations and quality systems; conditions; and ergonomics. It's located here. If you know of any tools and resources we didn’t include, send them to ControlMagazine@Putman.net with “Resource” in the subject line, and we’ll add them to the website. Do multiple sensors improve accuracy? Is there a process control degree and if so, at which universities?